Beyond the Tank is back with its sophomore season — and it’s got bite. A spinoff of Shark Tank, Beyond the Tank shows the business-savvy sharks — Robert Herjavec, Barbara Corcoran, Lori Greiner, Daymond John, Mark Cuban, and Kevin O’Leary (a.k.a. Mr. Wonderful) — checking in on entrepreneurs and their respective businesses after they’ve appeared on the original investment show. Here, Herjavec — a tech tycoon whose investment in the sippy cup company Lollacup will be among those featured this season — looks ahead to the series’ return, beginning with a preview episode on Tuesday at 10 p.m. ET and its season premiere episode on Thursday at 8 p.m. ET. Continue on for Herjavec’s thoughts on the reality of the stakes, what makes a business stand out to him in the first place, his reputation as a “nice shark,” and more. ENTERTAINMENT WEEKLY: What can viewers expect from season 2 of Beyond the Tank? 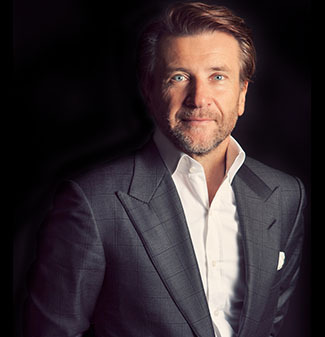 ROBERT HERJAVEC: The one thing we know is people love it. We did a short season of three episodes and ABC bought more right away. What it tells us is over the seven seasons of Shark Tank people have become invested in some of these entrepreneurs and they want to know what happens after the limelight goes down and that’s what Beyond the Tank is. It’s the hard truth and the gritty reality of running a business. So season 2 is similar to those first three episodes? Yeah, we learned [that] people really love the format. It’s going to be very similar, but lots of drama. Running a business is a soap opera on steroids. Are the stakes played up at all for television? No, not at all. Most people read about these people in Silicon Valley raising $20 million and losing it all and “Oh well!,” everybody’s friends after, but the reality is for the vast majority of people who start a business, they’re putting their life on the line, they’re emotionally invested. They’ve got all their savings on the line and if it fails they’re in trouble — many people in business, or that watch our show, don’t realize [that] business is a very high-risk proposition and it’s not always warm, fluffy, and feely. Do you have any input on what businesses makes it onto Beyond the Tank? That’s interesting because all the sharks [and] entrepreneurs realize that getting more TV exposure is good for your business, so it’s a bit of a jockeying process because all of us love our entrepreneurs and we want all of them to be featured over the other ones. In that case, do you have a strategy? If there’s a business of yours that needs more exposure, will you push for it? I think my strategy is I try to beg better than the other sharks to the producers, buy better gifts, find out where they’re going on vacation, pay for it — you know, that kind of stuff. Beyond the Tank gives a behind-the-scenes look at entrepreneurs and their businesses after they’ve appeared on Shark Tank, but it can’t include everything. What else is going on that viewers aren’t privy to? It’s more of the same. What I love about Beyond the Tank is one of the challenges I always have with Shark Tank is, to a certain degree, we romanticize being an entrepreneur. I think that’s important because before our show there was really no format that did that, but just like any romance, sometimes it doesn’t work out. You got to go into it with your eyes wide open. Beyond the Tank shows people the good, the bad, the ugly. What makes you say yes to a business opportunity in the first place? What makes you want to stick with it and see it through? It completely depends on the situation. People don’t realize, we know nothing about these businesses before they come out. Sometimes you invest in an entrepreneur and sometimes you invest in the idea. In a perfect world, you have a great operator with a great business, but I’d rather invest in the individual because a great entrepreneur can turnaround a struggling business, but a bad entrepreneur can run a good business into the ground. How many Shark Tank-related projects are you working on right now? We all have teams of people that work on this stuff. I tend to work on the ones that are in trouble or doing really well, or trying to help them get across that next finish line. All in all I think we’re at about 35. We have lots. [We’ve got] Tipsy Elves. We have an amazing deal with Happy Feet, which are the slipper people. We just signed an incredible licensing deal with them that, to be frank with you, neither they or I really thought we were going to be able to make happen, but [we were able to] with the magic of Shark Tank and a lot of teamwork. The thing we all learn is the measure of success changes over the years. We’ve all had one big home run, so I think what we’re all hoping to do is make sure they’re all successful, but really look for a big home run from the show. I think we all have a different philosophy. My philosophy is I’m deeply invested financially and emotionally to the people who we take on. We’ve had a great success rate. We think we’ve averaged about 12 percent return across all the investments. We’ve never fully lost our capital. We have some that are in trouble, but we think we can turn them around. It’s an ongoing process. All the sharks have reputations, and yours is that you’re a nice shark. What do you think of that? I am a nice shark. I tend to be nice, but what I like about that is you don’t have to be an a–hole to do great in business. I think the impression most people have is you’ve got to be really mean and miserable and crusty, kind of like Barbara and Kevin, but the reality is you just can’t be a pushover. You have to have the confidence to stand up for yourself because nobody wants to do business with a wallflower.